After only a few weeks traveling through Ukraine, I’m convinced it’s one of Europe’s hidden gems. I’m now on a mission to convince people to plan a trip to this Eastern European country. Ukraine is one of the biggest countries in Europe, but is a relatively new travel destination and tends to be overlooked by mainstream travelers. However, if you are looking for a place with beautiful nature, rich culture, friendly people and great food, Ukraine is a great choice. In case you need more convincing I’ve come up with 52 reasons you should visit Ukraine. Note: I’ll do my best where possible to include the Ukrainian spelling. If you’re looking to travel Europe on a budget, book your flight to Ukraine. Kiev (Kyiv) as a travel destination is considered one of the cheapest among the European capitals. The rest of Ukrainian cities are even less expensive. Here are a few examples of the prices you might find (if you visit soon!). 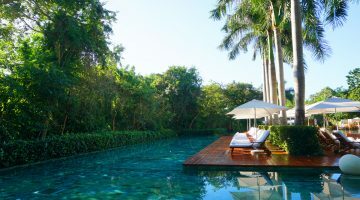 You can find hostels for less than $10 a night, an entire apartment on Airbnb for $30 a night, opera tickets for about $8, lunch for under $5, coffee for a buck or two, admission to attractions for $2-$3, and cocktails for about $3-$4. Europe has thousands of hidden treasures. The lack of mass tourism in Ukraine has allowed it to retain a charm and authenticity often missing in more popular European destinations. Come to Urkraine to explore the vibrant cities, ancient castles, stunning countryside, and meet the friendly people. Lviv is Ukraine’s largest western city and one of its historic cultural centers. The city is about 70 kilometers from the border with Poland. The center of Lviv is 14th century medieval. It’s here where you’ll find most of the hotels, restaurants and rich history. My first experience in Lviv, was meeting friends for a drink in the medieval city center. The Drunken Cherry serves one cocktail; a cherry infused homebrew (vodka) with marinated cherries. As we stood outside on the cobblestoned sidewalk enjoying our cocktails, a table of locals broke out into song. That experience was the anchor to the remainder of my time in Lviv and I will always remember the people as friendly and fun. It’s not an easy place to find as there are no signs for this secret bunker restaurant whose name means ‘clandestine shelter’. Look for #14 on Market Square (Rynok Square) and then enter the alcove and look for a wooden door and knock loudly. 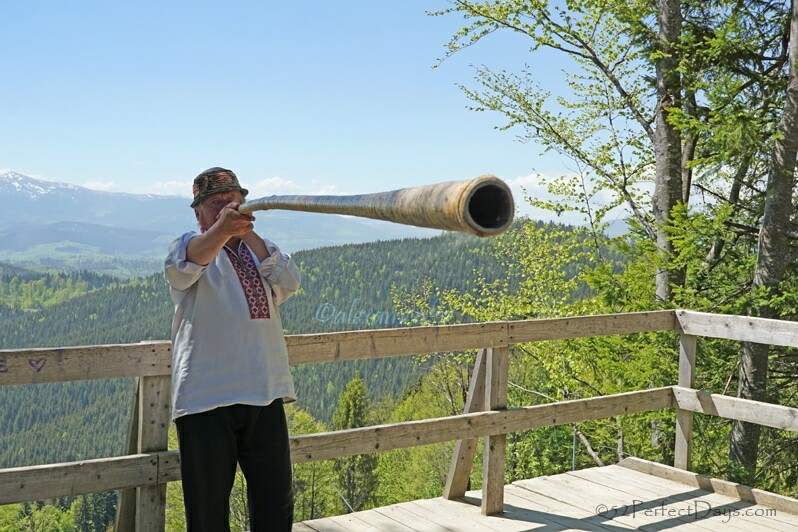 An ‘armed’ guard will shout “Slava Ukraina”, to which you reply “Heroyam Slava!” – meaning “hail to our heroes” – and access will be granted to the red brick vaulted cellars (think Hogan’s Heroes). The theater is in Svobody Square and opened in 1900. It was built in the Neo-Renaissance style and is beautiful and ornate inside and out. 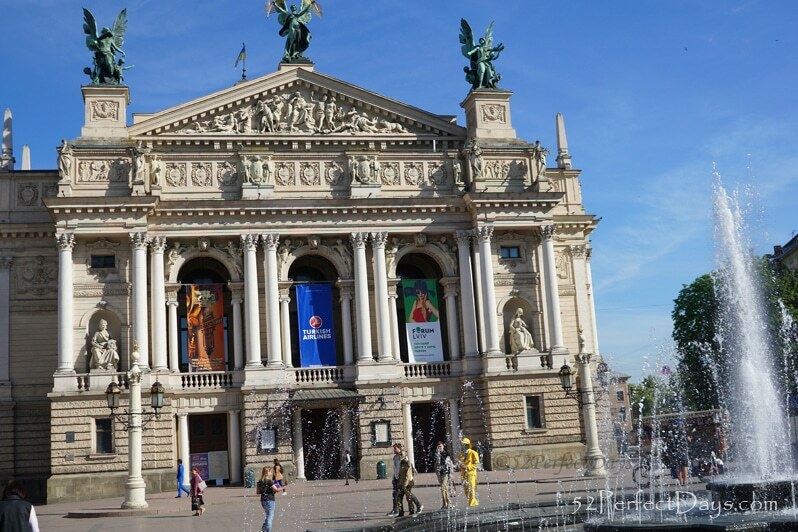 You’ll find both productions of Ukrainian operas and classical ballets at the theater. I can’t promise you’ll have the same tour guide or flame throwing coffee barista, but it’s worth a visit either way. This coffee house has created a tour with a far fetched story about how coffee is ‘mined’ in Ukraine. It’s fun and the best part is it ends with a delicious coffee that tastes similar to a creme brulee. I’ll warn you now. It’s a lot of stairs to reach the roof of this chocolate shop. But, it’s worth it. The view and their dessert menu is amazing. 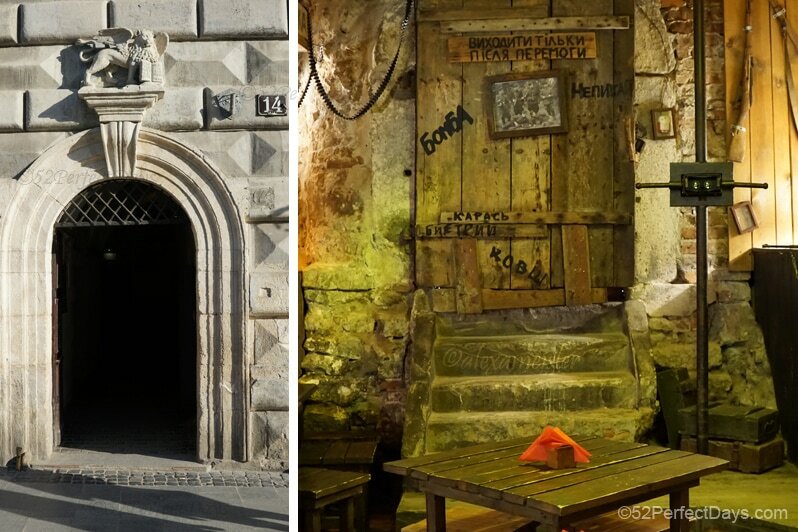 Learn about the history of Lviv and beer at this interactive museum. After a tour, head upstairs to check out their latest gallery art and for a beer tasting. A statue to Taras Shevchenko, a 19th-century poet is located in Svobody Square. Shevchenko is considered one of the fathers of modern Ukrainian literature. His literary heritage is regarded to be the foundation of modern Ukrainian literature and, to a large extent, the modern Ukrainian language. 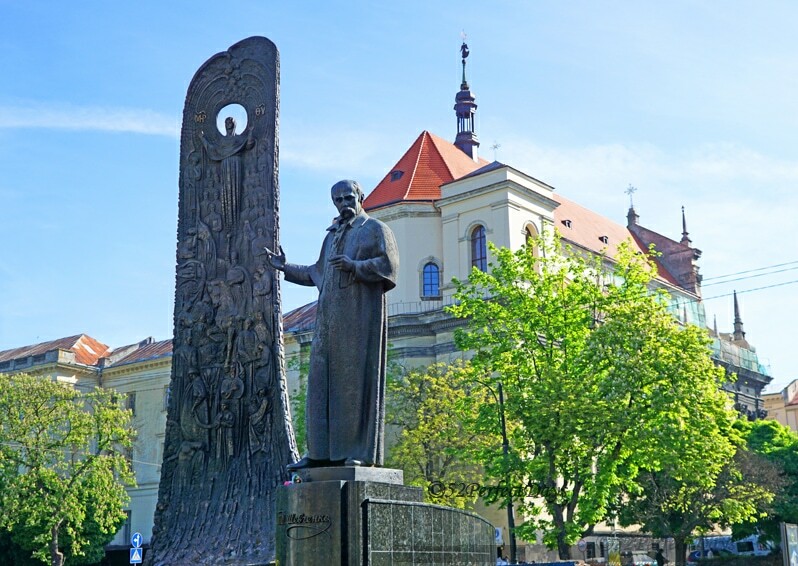 Not only will you find a statue in Lviv, but you also find one honoring him in every village or city in Ukraine. In fact there are over 350,000 statues of him in Ukraine alone. This Cathedral built between 1363–70 can be found in near the main market square on Virmenska Street. You don’t need to be religious to appreciate the beautiful architecture and fresco’s. Kiev (Kyiv) is the capital and largest city of Ukraine. It’s located in the north central part of the country on the Dnieper River. Because of World War II bombings, the city has been rebuilt in mostly Soviet Style architecture. This offers a much different look that the Western part of the country. Kiev is the seat of the government and where the 2014 revolution took place. It’s a vibrant city with lots of cathedrals, churches, wonderful restaurants and art galleries. 11. 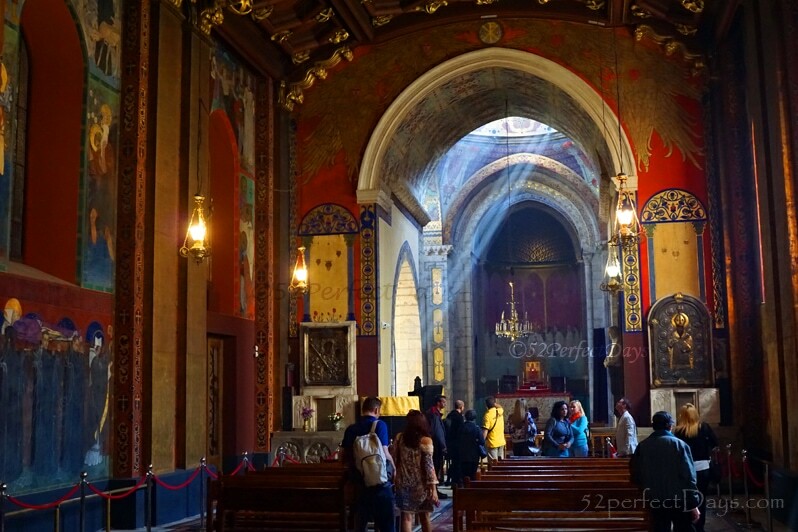 Visit the Kiev Monastary of the Caves This 11th-century historic Orthodox Christian monastery also know as Pechersk Lavra (Kyiv Pechersk Lavra) is a city within itself. There are 25 gold-domed churches, 150 buildings and it’s known for the caves dug by monks in the 11th century that include the burial chambers of Orthodox monks, and a collection of gold objects from ancient Scythian times. Officially known as The National Museum of the History of Ukraine in the Second World War, this memorial complex covers more than 2700 acres and commemorates the German-Soviet War. The complex includes many sculptures, but the highlight is the Motherland Monument. The museum building has more than 17 thousand exhibits that reflect the greatest military conflict of the 20th century and emphasizes the contribution of the Ukrainian people in the achievement of the victory over Nazism. One of the oldest and most popular streets in Kiev. It is considered one of the city’s most artistic streets, as it has many wonderful art galleries, you’ll also find it’s lined with merchants selling souvenirs. Look past the kitschy souvenirs for wonderful cafes, galleries and locally made shoe shops. You’ll also find the beautiful St. Andrews church as well. This is the central square of Kiev and located on Khreshchatyk Street. It is also the location of the protests that occurred during the revolution of 2013-2014. The heavenly 100 were anti-government protesters who were killed during the revolution and protests that occurred from November 2013 until November of 2014. The massacre that took place in February 2014 triggered the collapse of Ukraine’s pro-Russian government, prompting Moscow to annex Crimea and sparking a separatist war in the east. Ukraine has a complicated history and this is just one piece. 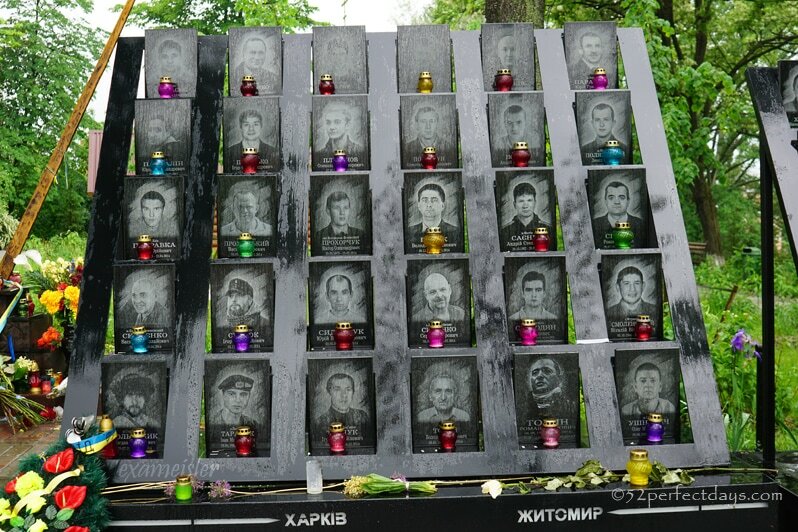 I encourage everyone who visits Kiev to visit the square and the street above that memorializes the citizens who were killed during the revolution. The UNESCO heritage site encompasses cultural heritage monuments from the Middle Ages. Saint-Sophia is Kiev’s oldest standing church. While the exterior is beautiful, the interior is the most astounding aspect. Many of the mosaics and frescoes are original, dating back to 1017–31 and there is a strict no photography policy inside the cathedral. 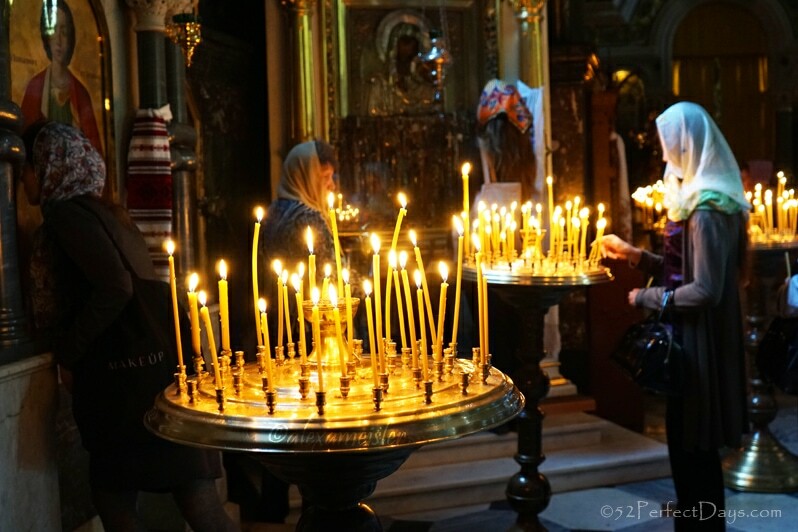 St. Volodymyr’s Cathedral is a cathedral in the center of Kiev. It is one of the city’s major landmarks and the mother cathedral of the Ukrainian Orthodox Church – Kiev Patriarchy, one of two major Ukrainian Orthodox Churches. Kiev offers more than 1,600 restaurants. The food culture is vibrant and you can find just about anything. 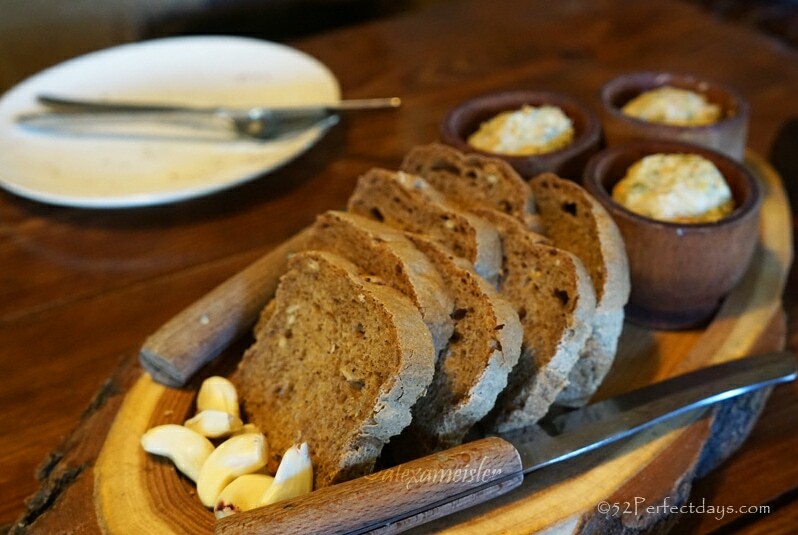 But, when in Kiev (Kyiv), try a few local spots! 19. O’Panas (О’Панас, ресторан), located in Shevchenko Park is a great choice for traditional Ukrainian food. It looks like countryhome or even a hut in the middle of the woods. They offer live music and food that is sourced from local, private gardening. They also have their own brand of vodka. 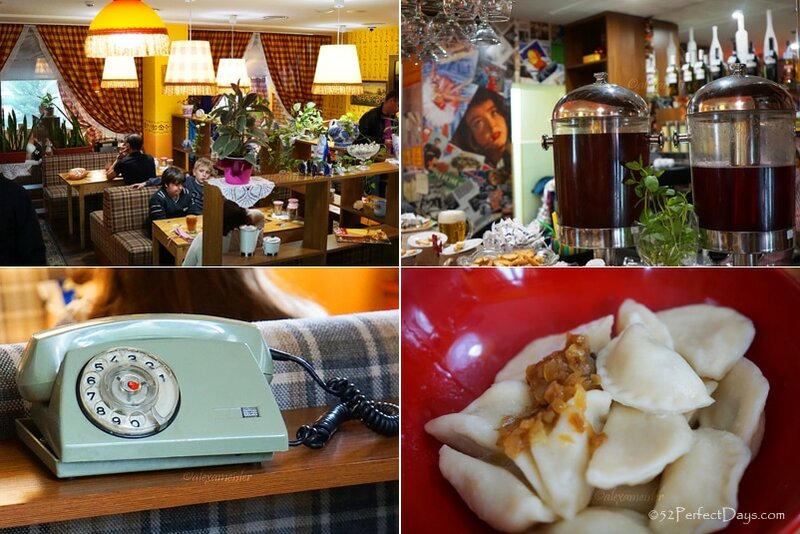 The restaurant is decorated like a typical Soviet Style home from the 1980’s. The menu looks like a Soviet newspaper. They offer a huge choice of entrees, but as you might guess they have a wide variety of perogie choices. 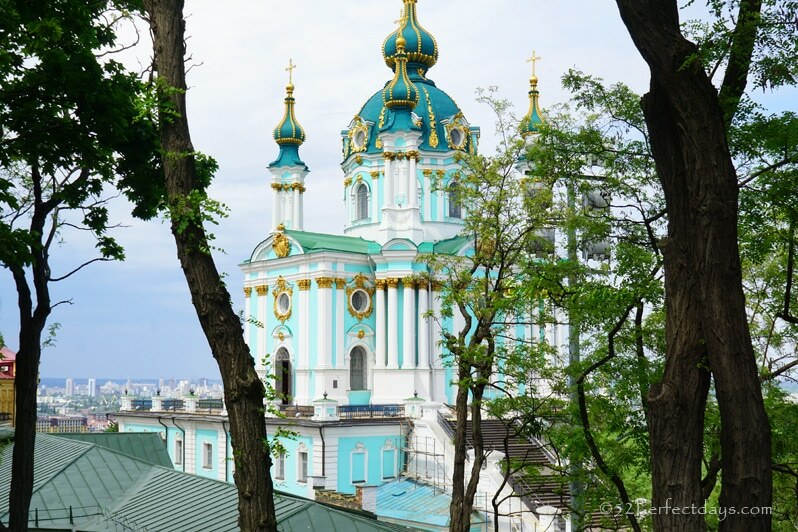 Check back soon for my full list of 52 Things to do in Kiev! 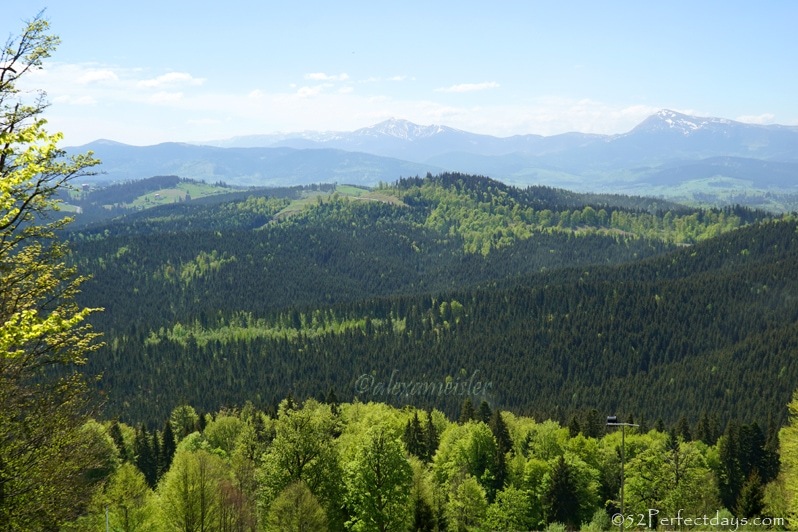 The Carpathian Mountains form a 1,500 km-long range in Central and Eastern Europe. They consist of a chain of mountain ranges that stretch in an arc from the Czech Republic in the northwest through Slovakia, Poland, Hungary and Ukraine to Romania and Serbia. They are second-longest mountain range in Europe. This is the highest mountain in Ukraine (2,061 metres (6,762 ft)). The mountain is located in the Eastern Beskides, in the Chornohora region. This is a pilgrimage for many Ukrainians and considered a very proud accomplishment. Bukovel Ski Resort is the most popular place to ski and snowboard in Ukraine. Bukovel has well maintained and diverse ski slopes, for all levels, from beginner to advanced skiers. The Roller Coaster Zipline is ride through the forest featuring steep turns and drops. 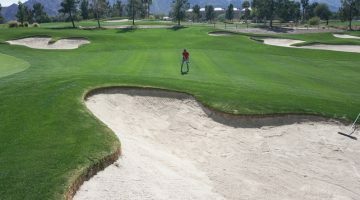 The course is located on the mountain at the top of the first chair lift. The Cheremosh river is known for turbulent rapids. One, two and four day trips can be booked. There are many mushrooms in the Carpathian Mountains in autumn, especially after warm rains. More than 200 kinds of mushrooms grow in the Carpathians and on average you can find more than 300 mushrooms a day. Many of the hotels can arrange for guide for mushroom picking. 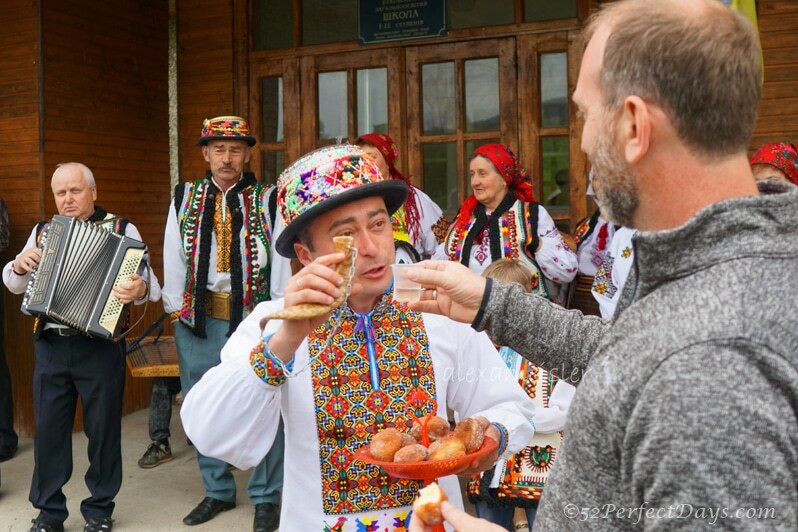 Hutsuls are an ethno-cultural group of Ukrainians, who for centuries have inhabited the south-easternmost Carpathian mountains, mainly in Ukraine and in the northern extremity of Romania. Traditional Hutsul culture is often represented by the colorful and intricate craftsmanship of their clothing, sculpture, architecture, woodworking, metalworking, rug weaving, pottery, and egg decorating. Kosiv is the biggest town in the region and has a daily open air food bazaar. In addition the main street offers many shops that sell handicrafts and folk art. Many of the items such as purses, jewelry, souvenirs are handmade. This cave once served as a refuge for the rebels and there are many leg­ends about caves in Dovbush. The caves are named after a legendary rebel and located 11 km to the southwest of Bolekhiv, not far from the village of Bubnyshche. It is said that not visiting the University in Chernivtsi is like not seeing the Eiffel Tour in Paris. This public university, which focuses on theology was founded in 1875 as an orthodox church. It was designated a UNESCO World Heritage Site in 2011. The architecture is considered from the time of the Austro-Hungarian Empire. The Jewish Museum is dedicated to the remarkable but little-known phenomenon of Jewish population of the Bukovinian area. The small museum chronicles the history from the end of eighteenth century to the 1940s. Before WWII there was a population of 45,000 (35%) in Chernivtsi and today there are no Bukovinian Jews. 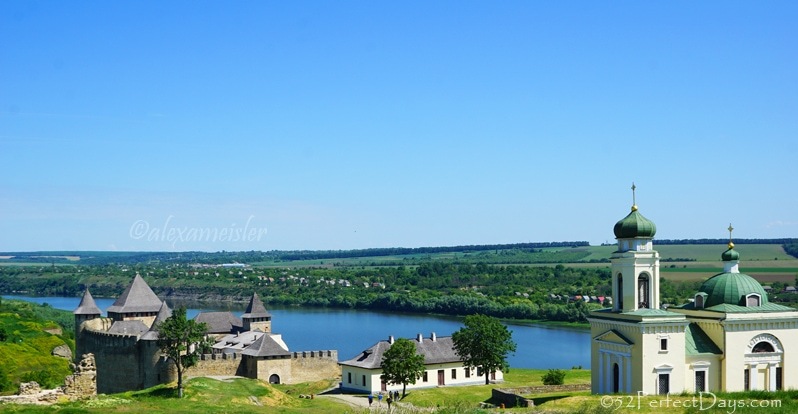 This fortification complex is located in the province (Oblast) of Chervivisti and the town of Khotyn on right bank of the Dniester River. 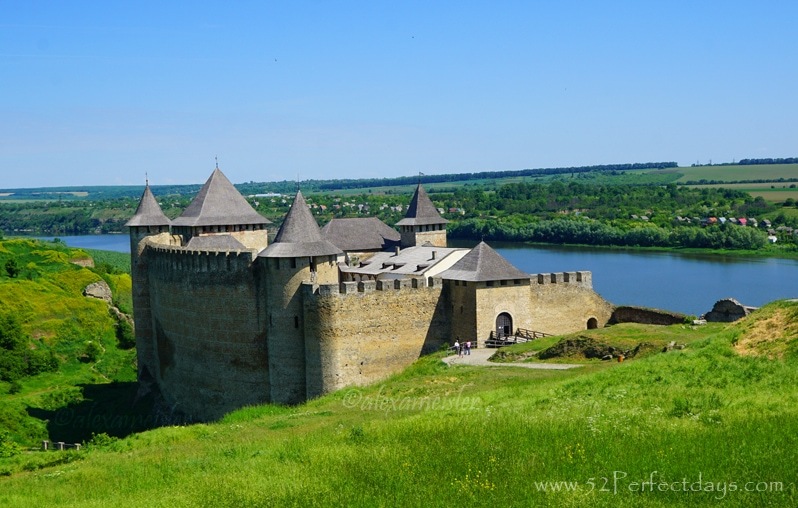 Construction of the medieval Moldavian style castle began in the 13th century. It’s the location of a major battle and what is known as the beginning of the fall of the Ottoman empire. A former Ruthenian-Lithuanian castle located in the Podolia Region. 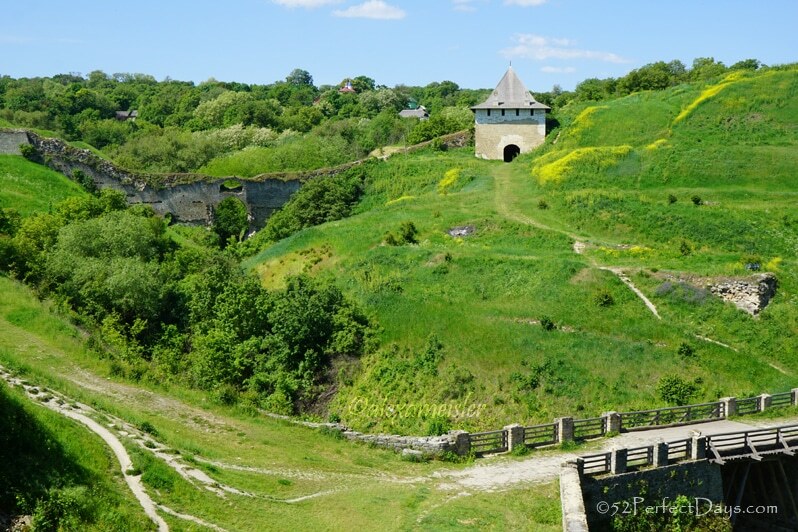 It was later a three-part Polish fortress and is located in the historic city of Kamianets-Podilskyi. The castle is located on the Smotrych River. Odessa is known for its beaches and 19th-century architecture. There are many beaches all over the city, but the one closest to the center is Lanzheron. You can’t visit Odessa without dipping your toe in the Black Sea! Underneath Odessa lies a huge network of tunnels known as the Odessa catacombs. They are a big part of the city’s history, having been a refuge for Soviet partisans during World War II and later smugglers. You can explore the tunnels on organized tours such as the Secrets of Underground Odessa. Do not attempt to visit these tunnels on your own or with an unregistered guide. 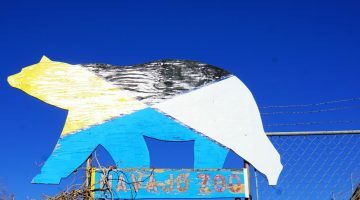 A pedestrian walkway in the heart of Odessa where you’ll find restaurants, bars, cafes and shops. A great street for strolling, enjoying the views, and admiring the beauty and vibe of the city. 38. 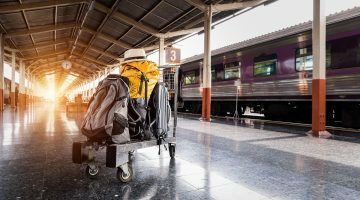 Take an Overnight Train. You can catch the overnight train from Chernivisti to Kiev. It’s a great way to see the countryside and travel back in time. 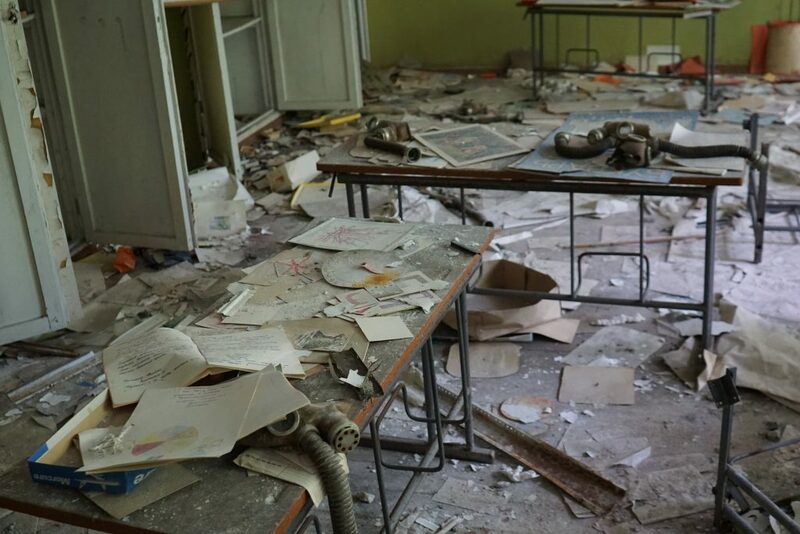 A tour of Chernobyl can be planned with tour companies such as SoloEast, as you can’t visit without a licensed guide. The tour with SoloEast starts during the drive from Kiev, where they show documentaries and news footage of the most serious nuclear reactor disaster in history. There are 12 checkpoints within Chernobyl and many rules to be followed to stay safe from radiation, as some zones have more than others. The experience is sad, overwhelming and beautiful all at the same time. Note: Do not attempt to visit these tunnels on your own or with an unregistered guide. The museum is located in western Ukrainian city of Kolomyia in the Ivano-Frankivska Oblast (region). 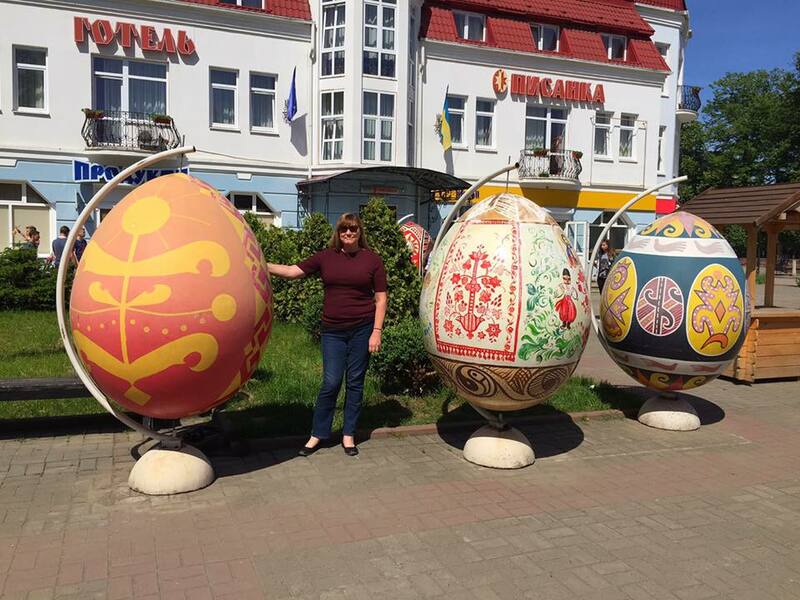 The museum possesses a collection of over 10,000 pysanky (Ukranian Easter eggs). Verteba Cave – the only museum in Ukraine cave, inside which there are dozens of archaeological excavations of ancient Tripoli culture. Unique of its kind, Verteba is not only the guardian of the priceless artifacts, which are more than a thousand years, but is considered one of the largest caves in Europe. The total length of underground tunnels and halls of more than 8 kilometers. The music of Ukraine differs from region to region. To get a great feel for the culture and history, there is no better way than to attend a live music or dance performance. 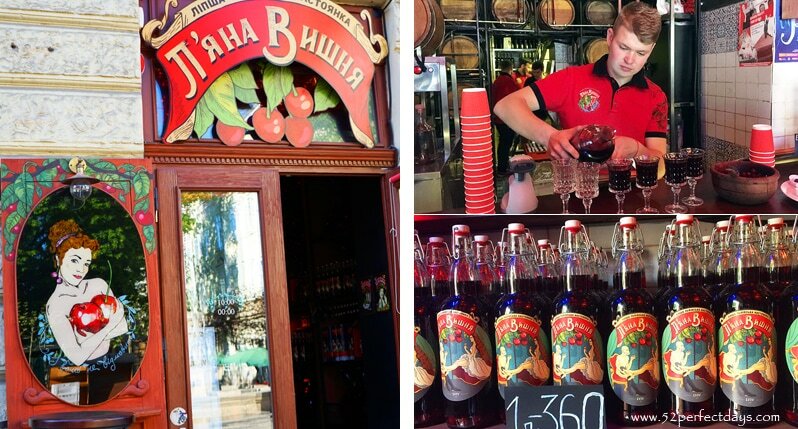 Here are just a few of my favorite foods I discovered while in Ukraine. Overall the food was amazing and I could have lived off the variety of salads and borscht soup alone. But, if you are plenty of other delicacies you’ll find from hand made sausage, to Pirogi’s, stuffed cabbage rolls, potato dumplings and of course, chicken Kiev. You’ll find variations of borscht throughout Ukraine, but if you want a truly memorable meal, make sure to visit Panska Huralna in Chernivtsi. 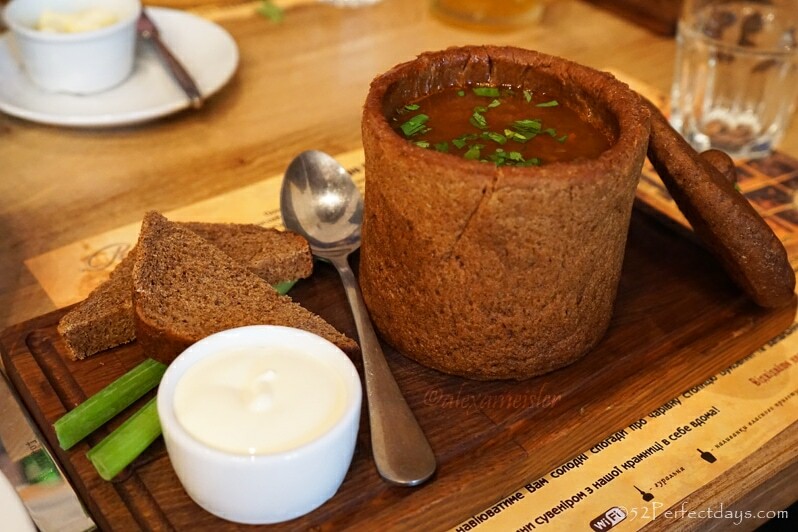 Here they serve the soup in a housemade bread that looks like a crock. Salo is a white pork fat and a national Ukrainian dish. Ukrainian salo is served in slices and sometimes a puree with bread and garlic. One of my favorite dishes. It’s a cornmeal that is cooked similar to polenta and served with crumbled cheese and mushroom sauce. Also known as varenyky, these filled dumplings can be found throughout Central and Eastern Europe. Each country has their own unique take on these mouth-size bites. Also known latkes, these are made from grated potato, flour and egg, and often also have grated garlic or onion. This is a homemade clear alcohol that is flavored with many roots, herbs or berries. My last and final reason (although I think I could easily come up with another 52!) is to explore the countryside and small villages. Note: In my posts about Ukraine I choose the spelling “Kiev” as that is what most travelers use when researching. However, the transliteration from Ukrainian is “Kyiv,” which is important to know. If you are ready to learn more about Ukraine and are interested in an organized tour, I highly recommend Cobblestone Freeway Tours. You can find them at www.cobblestonefreeway.ca or call +1 780-436-7482. 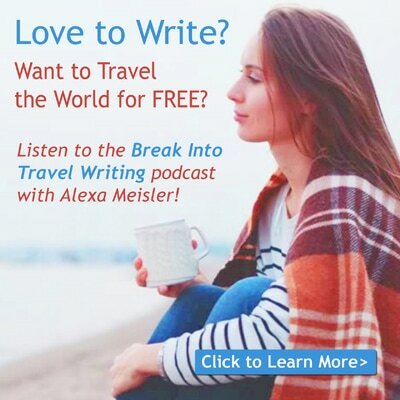 What is at the top of your travel to-do list? 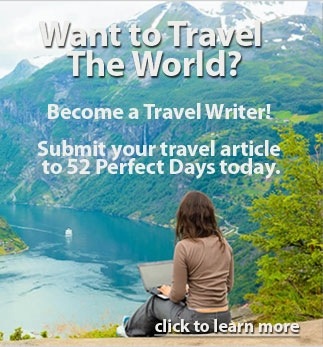 Where do you want to visit most? What are your favorite things to do in Ukraine? Share in the comments below. Pick up the Lonely Planet guide to Ukraine . Get a good quality mirrorless camera for getting amazing photos of the many beautiful sites in Ukraine. I use the Sony Alpha a6000 . Weather is unpredictable, so bring a lightweight umbrella and rain jacket (even in summer you may find areas chilly and rainy). 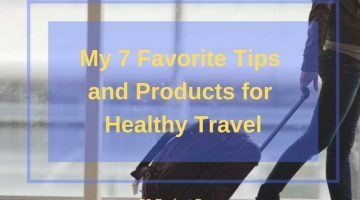 I have had Ukraine on my travel bucket list for a while now, but these 52 reasons to travel to Ukraine make me want to book my flights now. I mean, what’s not to love? It is cheap, super interesting history and culture and the food is amazing. For my husbands birthday I gave him a trip to Chernobyl. As an engineer he LOVED it and raved about the Ukraine on his return. I sent him alone as we have 2 small children and I didn’t think it would be a good place to take kids, but it looks amazing and now I want to go too! You’re making me want to visit! A cocktail with marinated cherries. Awesome! Loved the decor of the Varenichnaya Katyusha. Can’t wait to visit the Carpathian Mountains and the Khotyn fortress. Wishing I was there exploring right now! Nice post! 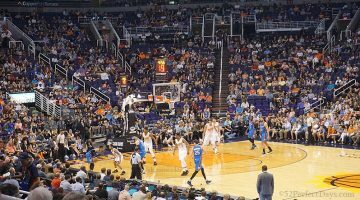 We had hoped to go this year but it didn’t work out – but definitely in the plans for 2018! It’s not a country I would normally have put on my travel list but now I’m definitely considering it! 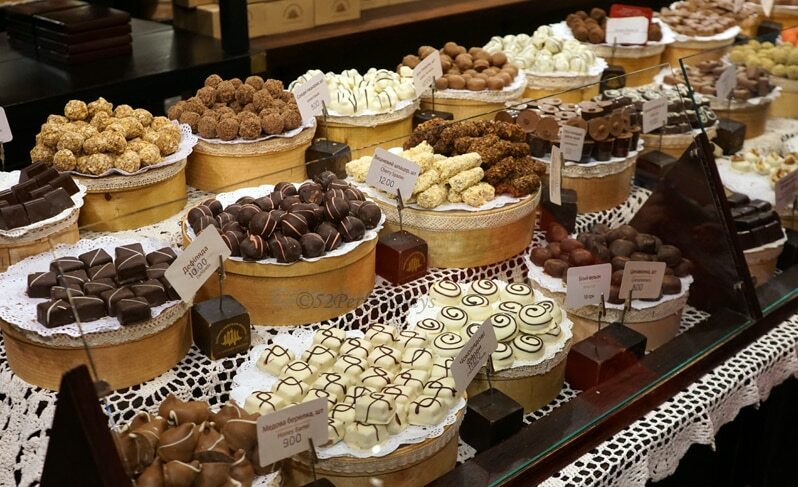 I’ve heard nothing but great things about the Ukraine – out of your 52 reasons, I’d definitely go for the food and chocolate. YUM! Wow Ukraine looks so cool. Where do I start? I love that is has maintained its old world charm and it is not over run by tourist. I am curious to try the drunken cherry cocktail! I want to explore the catacombs, the caves, castles…all of it!